“I was born in an antimatter reflection of your universe. Where I live, good is evil and vice versa.” So says Alexander Luthor to the Justice League of America, after traveling from his universe in order to deduce a way to defeat the antithesis of the JLA: the Crime Syndicate of Amerika (whose members include evil JLA doppelgängers Ultraman, Owlman, Superwoman, Power Ring, and Johnny Quick). This group is the complete opposite of the Justice League in every way, with their motto even proclaiming, in Greek, “Cui Bono” – “Who profits?” Batman, Superman, Wonder Woman, Flash, and Green Lantern join Luthor on the journey from their “matter universe” to save the “antimatter”universe, while Aquaman and Martian Manhunter stay on earth (or Earth 2, as the “good” Luthor has dubbed it) to hold down the fort. 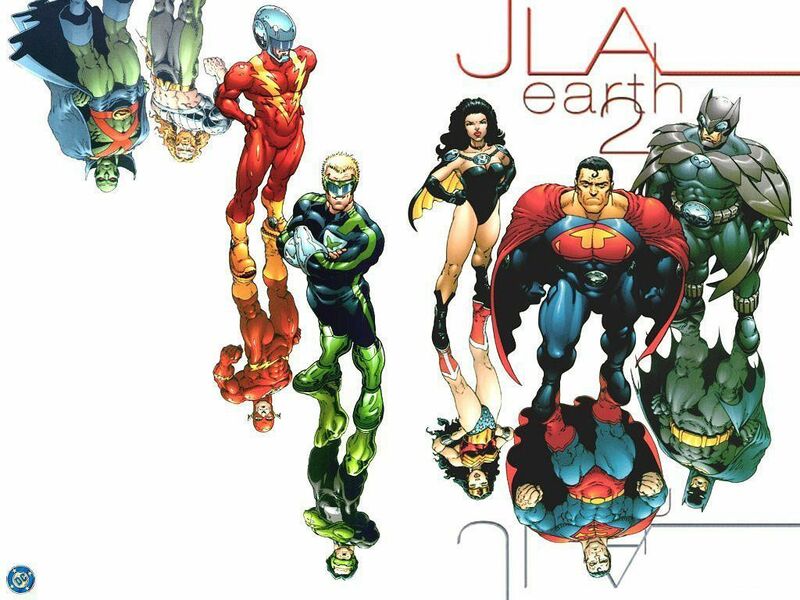 With the graphic novel “JLA: Earth 2”, writer Grant Morrison and frequent collaborator/artist Frank Quitely have created a book that is epic in scale, yet feels very personal because of the existential questions it asks about good and evil. Morrison writes the JLA the way they were meant to be written: as the world’s greatest superheroes. The JLA is out to redeem the antimatter universe, while the CSA wants to exploit Earth 2. Morrison and Quitely explore if these teams’ opposing missions can possibly be reconciled. 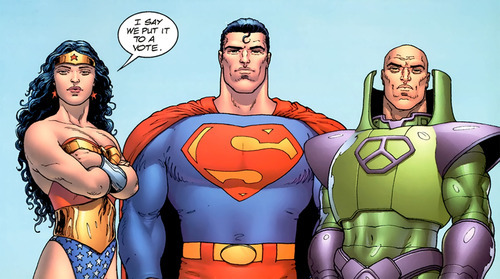 The epic nature of the JLA is expressed beautifully by Quitely when members of the JLA first appear in the book. Superman, Martian Manhunter, and Wonder Woman are seen gliding gracefully up toward a falling airplane in a beautiful two page splash. The first word that the mind conjures is elegance. They seem to be effortlessly heading toward their mission to save the passengers, demonstrating their calm demeanor and pure acceptance of the mission they have devoted their lives to: being saviors to those in need. The poses the strike with ease as they ascend convey to the reader that it’s natural for them to be heroes. At the bottom of the two page splash, Morrison and Quitely hearken back to stories of old with the “roll call” of the heroes and villains. The reader quickly is given the players, but not the stakes (yet), in the battle between good and evil. 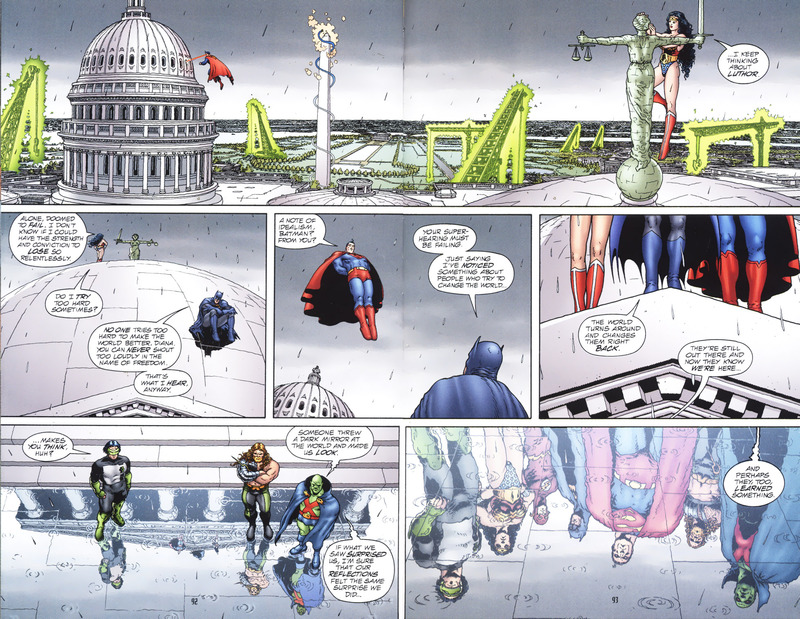 The scene where the JLA decides to assist in the heroic Luthor’s mission demonstrates the influence the heroes have on each other, as well as why they are considered their world’s greatest heroes. When Luthor begs for the aid of the JLA against the “tyranny” of the Crime Syndicate, Batman makes his first appearance in the book with the emphatic response of, “I say no.” Batman coming from the shadows and the expressions on Superman and Luthor’s faces are priceless. Luthor then pleads his objective to Batman and explains how he “risked everything to reach this universe. Don’t send me back to that hell with just platitudes! Have you no idea what it is to be alone against a world of shadows?” (emphasis in bold included in the book). With such powerful words, the reader knows what Batman has been through in his dark past and also that he has a team of support, unlike Luthor in his universe. Through art alone and such spare and powerful words, the reader gets the universe-wide, as well as personal, stakes of this story. Wonder Woman, with arms folded (as she is seen doing authoritatively throughout the book), says. “I say we put it to a vote.” The League then discusses together, as a team, why they need to and will go on this mission, with Superman telling Batman, “Alone against a world of evil, Batman. I’ve made my decision.” In that powerful panel we see the backside of Superman and the “S” symbol on his cape while he faces Batman, who sits pondering with two fingers together near his lips. He then says, “Aquaman stays. J’onn stays. I’ll take the vacation.” Batman, with a touch of humor thrown in, acquiesces to the other members, knowing they’re correct in their decision. Without admitting he’s wrong (which would be uncharacteristic of Batman), he volunteers himself to go with the most powerful members to a dangerous and unknown place. With those fingers placed in front of him, this brave and powerful human has shown he is worthy to stand among gods. Every member of the JLA believe in their unending mission to promote virtue. Humor, through the writing and art, lighten up a story that has such huge stakes for our heroes and humanity. In the antimatter universe, Benedict Arnold is on the dollar bill and every human has their heart on the right side. Everything, truly, is opposite in this world. In one stunning yet comically epic splash page, Green Lantern holds the twisted world’s moon with two huge green hand constructs from his power ring in order to trap the CSA . A few pages later, the hands holding the moon look even more hilarious and even Monty Python-esque. Towards the end of the book, Superwoman, looking awestruck and confident, proposes that Martian Manhunter replace Ultraman at her side and they rule the world together. “We are from different species,” declares Manhunter. “I’ll try anything once. Ask anyone,” says Superwoman, with furrowed brow, come-hither eyes, and pursed lips. Manhunter shoots her proposition down coldly and hilariously, with Superwoman’s face turning to one of anger. She even holds one hand to the side of her face, as if doubting her beauty. Through humorous, as well as non-humorous, moments, words and art mold themselves together into astounding art. 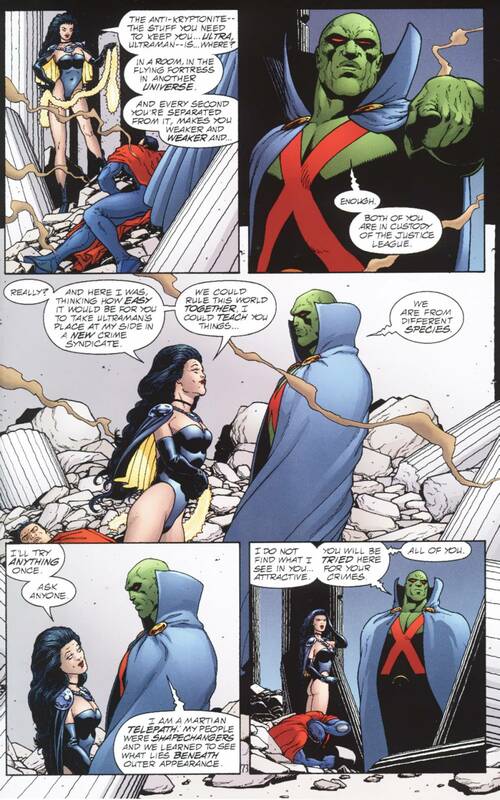 Martian Manhunter is propositioned by Superwoman. Musings about the meaning of good and evil are expressed by the heroes (as well as the villains) throughout the book. In one scene, Batman expresses reservations about their mission on the antimatter world to Wonder Woman. He wonders if, because the world they are trying to save, as well as the Crime Syndicate, are their “opposites in every way…how will what we do here be reflected back home?” Wonder Woman replies by saying, “Evil isn’t the reflection of good, Batman. Good is the reflection of good.” Such powerful words will give the reader chills because good is expressed so simply and beautifully. By being good and doing good, which every member of the JLA strives to accomplish, then that good will be reflected back in the world. Good and evil do not need each other to survive. Good simply is good on its own. Owlman, Batman’s opposite, realizes both sides’ missions are futile and states that “Our word ‘good’ is their word ‘evil’.” What the JLA considers good is, in actuality, “bad” on the antimatter universe. Since good always triumphs, what the CSA considers “good” will always prevail on their world. “Good”, then, as expressed in such an ingeniously mind-bending way by Morrison, will always trump bad. Whatever a particular society or people deem to be moral or good will always win in the end. As the epic conclusion of the story collides to an end, Quitely expresses the enormity of the moment in two pages. The top half of the two pages is a two page splash, with a world literally on the verge of colliding into the other. Hero and villain alike look awestruck. The ultimate villain of the story (who will go unnamed in this review, so as to not spoil the surprise for the reader) exclaims some wonderfully thought-provoking diatribes. Yet the actions and words of the heroes are what stick with the reader. Superman takes the full brunt of an attack, with a wincing face and a will that will not be defeated. Flash exclaims that his lungs are beginning to burn, yet he perseveres through the pain. These heroes are brave even through moments of supposed doom. The heroes do prevail, even though it seems they will have to compromise on their ideals. In a genius piece of writing and art, they are able to defy that possibility. In one last epic, yet very personal, two pages with the entire JLA team, we see them cleaning up the aftermath of the epic battle as they commiserate with each other. Batman, sounding an uncharacteristic “note of idealism” according to Superman, says he’s “noticed something about people who try to change the world…The world turns around and changes them right back.” As he says these last few words, Quitely’s art in the panel simply shows the legs of the trinity (Superman, Batman, and Wonder Woman). As the rain falls down, we then see in another panel all seven members of the JLA reflected in a puddle, with raindrops falling. Coming back to Wonder Woman’s idea from earlier in the book, the idea of good reflecting good is reiterated. By doing good for the sake of good, people are transformed into even better people. Simply being a good person makes one, simply, a hero.